Micrometeorites are constantly falling on the earth anywhere and at any time. Due to the small size of this tiny grains their collection and correct identification can be challenging. At astroGC we managed to collect and identify positively some micrometeorites. The first one, shared hereby has been found in North France. We need a clean outdoor surface. The gutter of this clean roof seemed to be a good place for finding micrometeorites. Unfortunately the trees in the nearby produced a lot of organic waste. But this was actually not a big problem. The leaves, dust, sand found in the gutter were mixed with a lot of water. Most of the organic waste floated. The remaining waste at the bottom of the container has been selected and the rest has been discarded. We used different sieves down to Mesh 80 and selected the grains between Mesh 35 and Mesh 80. This is equivalent to select grain sized from 0.5mm to 0.2mm. This has been done, again, using a lot of water. The last cleaning has been done using dish soap to remove any oily rest and prevent the grains to stick after drying. In this case we also used hair conditioner in the aim of obtaining a fine separated grains sand. This is part of the selected grains, before drying. The grains have been stored during a day or two in a dry room. On this picture we can still see a layer of organic rest that could easily be removed if needed as it floats in the water. We use a magnet to separate grains containing Iron and/or Nickel. The best way to do that is first to envelop the magnet in an aluminium paper, get the enveloped magnet next to the grains, and remove the aluminium to free the grains in a plate. 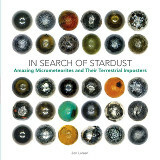 A small and cheap microscope is enough to find the micrometeorites. It is important to use a wide-angle eyepiece and a low magnification. We use in this case an Omegon StereoView, 20x. Many anthropogenic metallic spherules were discarded. We are looking for slightly elongated shape black spherules showing some metal beads if possible. Here is a first image of the micrometeorite. This picture has been done just sticking a mobile phone to the eyepiece. Microscope for taking a good picture. For a (much) better picture we managed to use an EPI-Fluorescent Microscope OLYMPUS BX51. But actually, there was no need of fluorescence. An EPI-iluminated microscope should be good. This is a picture of the micrometeorite with the EPI-fluorescent microscope. Magnification was set to X50. It can be seen that the image is only focused at a determinated distance. Due to the roughly spherical shape of the micrometeorite, the focused zone is a ring area. Focused area of the micrometeorite picture. In order to obtain a good image of the micrometeorite we made a video focusing from bottom to top. The computer made the rest. First we extracted 500 frames from the video. We have done that using FreeStudio. A free video to jpg images converter. The most important was still to come. We needed to select the focused area of each frame and make a huge collage of the 500 images. An open source program called Enfuse have done this dirty job for us. Notice the exposure has been set to 0, contrast has been set ot 1 and Saturation to 0. The bracket count has been left to 3 leaving 500/3=167 images on the first calculation. The following steps were similar, leaving 56, 19, 7, 3, 1 picture. On each step, the program creates new subfolders with long names. It is necessary to rename this folders to avoid surpassing the maximum length of folder+subfolders names of the operating system. Finally this is the result. The micrometeorite is a oriented barred olivine beauty with metal bead(s) and a partial iron sulphide rim.